Tens of thousands of Romanians joined European royals on Saturday to pay their respects to late King Michael as a state funeral got under way in Bucharest. Michael, who ruled Romania twice before being forced to abdicate by the communists in 1947, died in Switzerland this month at the age of 96. Britain's Prince of Wales, Sweden's King Carl XVI Gustaf and Queen Silvia, and Spain's former King Juan Carlos and Queen Sofia, were among those at a pre-funeral service at the Royal Palace where Michael's body had been lying in state for the past two days. Among non-European royals attending the funeral was Princess Muna al-Hussein, mother of King Abdullah II of Jordan. In the hours before Michael's coffin was taken out of the palace, Romanians gathered silently, many in tears, in Revolution Square. Church bells tolled around the country and a choir of priests sang as the coffin was taken out and laid on a dais in the square. The crowd cheered and shouted "King Michael!" as the coffin, led by Orthodox priests and a guard of honour, was transported by an army jeep towards the cathedral where the funeral was taking place. Michael's five daughters and his estranged grandson, Nicholas Medforth-Mills, who was stripped of his title for allegedly fathering a child out of wedlock, walked behind the coffin. Mourner Georgeta Anastasiu, 60, said the late king had been "demonised by the communists, but in the end we found out the truth about him". She called the king "the last moral example for Romanians", and said many people had finally learned the truth about him since his death on December 5. 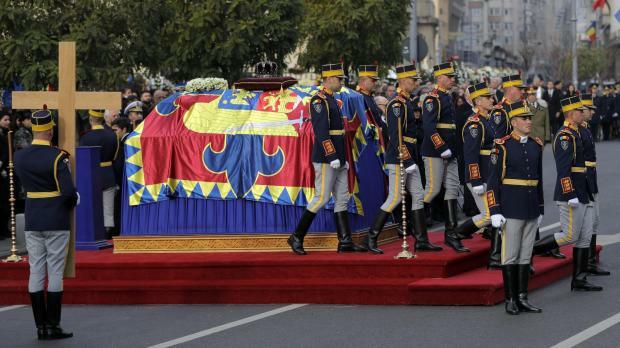 After the funeral service, his body will be taken by royal train to the central Romanian city of Curtea de Arges, where he will be buried next to his wife, Anne de Bourbon-Parme, who died last year.